Both Cincinnati and Columbus LOTH teams gathered over 125 supplies per location for Operation Backpack! Items ranging from rulers, notebooks, paper, markers, crayons, scissors, glue and more are being donating to the cause. 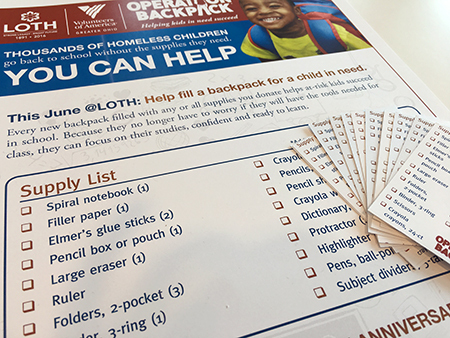 Operation Backpack®, collects and distributes brand new backpacks filled with school supplies to homeless and at-risk children throughout the Greater Cincinnati, Cleveland and Columbus areas. A filled backpack relieves struggling parents of a financial burden and provides a sense of normalcy to the otherwise chaotic lives of these children, helping them to look and feel more like their classmates. Most importantly, a filled backpack allows these children to start the school year feeling prepared and confident, with the knowledge that their education is important and that someone believes in them. We distributed posters to let our teams know about this event and supplied wallet sized shopping lists as a reminder of items to pick up on their next trip to the store. Update! Our supplies were officially turned in to the VOA in Cincinnati! We ended donating 10 backpacks with supplies and more than 400 loose supplies!